It is not easy to explain Lalu Prasad's success as India's railway minister and his earlier failure as chief minister of Bihar. While Bihar under his stewardship acquired the image of the most backward state in India, mired in poverty because of the lack of development, the same Lalu Prasad, when he took charge of the railway ministry, transformed it into a miracle of modern management technique. The astonishing nature of his achievement was highlighted during the presentation of the railway budget when he announced the enormous profit of Rs.20,000 crore (Rs.200 billion). And this remarkable feat was made possible without increasing passenger fares and freight rates. Not surprisingly, Lalu Prasad has become the toast of business schools, which are eager to fathom the secret of his success. So the one-time bare-bodied cowherd, who used to ride buffaloes in the paddy fields of Bihar in his poverty-stricken childhood, stalks these days into the hallowed precincts of management and business institutes to lecture an audience in business suits on how to successfully run an establishment. There is little doubt that behind his deceptive exterior ticks an astute mind, which has little difficulty in mastering the complexities of a behemoth such as the railways and ensuring that it operates at a profit. If he had only applied the same mental faculties - observers often say - to the problems of Bihar, the state under his Rashtriya Janata Dal (RJD) might have been as much of a success story as Indian Railways is today. It isn't that he didn't have the time. He presided over the state's political destiny for as long as a decade and a half. But he left it worse than when he found it. And he also paid a political price for his failure by losing the elections to his one-time friend, Nitish Kumar of the Janata Dal-United who has replaced him as chief minister. To understand why Lalu Prasad allowed Bihar to drift into decay and destitution, it may be instructive to consider the social factors that played a major role in his rise to power. It has to be remembered that his career in politics coincided with the period when the backward castes, to which he belongs, were making their presence felt in the Hindi heartland states of Bihar and Uttar Pradesh. The impetus to the emergence of the backward castes as a powerful political force was provided by the implementation of the Mandal commission report in the early 90s when V.P. Singh was prime minister. As is known, the emphasis of the Mandal report on castes led the pro-Hindu Bharatiya Janata Party to place its focus on communal politics in an effort to consolidate the Hindus vis-à-vis the Muslims and other minorities. 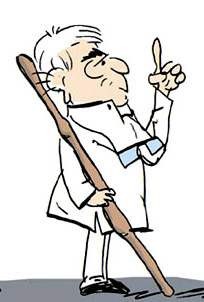 It is during this mandal-kamandal turmoil (kamandal being the utensil carried by Hindu holy men) that politicians like Lalu Prasad and Nitish Kumar in Bihar and Mulayam Singh Yadav in Uttar Pradesh - all belonging to the backward castes - came to represent influential forces to reckon with. However, the bane of their sectarian politics with its constant need for pandering to particular castes meant that their leaders had little time for development projects relating to health, education, water supply, power and roads. Instead, their whole attention was on manipulating casteist and communal elements in order to retain and strengthen their hold on power. As is usual in politics, they also had to cope with internal tussles, as when Lalu Prasad and Nitish Kumar - one a Yadav and the other a Kurmi - fell out and joined rival political formations. But it is not enough only to blame the preoccupation with caste-based politics for the failures on the development front. What is perhaps even more important is to understand the myopia of the politicians whose sole political capital was their association with particular castes. For Lalu Prasad the championing of the cause of his caste brethren not only meant endowing them with political power and social respectability, but also demonstrating that the leader himself had remained true to his village-based background. This close identification was unavoidable because it wouldn't be possible for, say, a city slicker to earn the political loyalty of the mainly rural, caste-based followers. In fact, the sophistication of conduct associated with the urbanites had to be shunned, and the very deficiencies of the backward castes in terms of purported social graces paraded with aplomb. This attitude was echoed by former West Bengal Finance Minister Ashok Mitra when he said, "I am a communist, not a gentleman". Just as the bourgeois gentleman's polished demeanour became a matter of derision for a representative of the proletariat, similarly the backward castes were supposed to take pride in, say, the lack of a working knowledge of English. What was supposedly a drawback for a community became its badge of distinction. In his personal habits, language, clothes and lifestyle, therefore, Lalu Prasadwas a virtual mirror image of the members of his caste who live in the countryside. Unlike any of his predecessors, like Karpoori Thakur, another backward caste chief minister, Lalu Prasad was a master in playing this role. He made it a point to be seen among his cows, sometimes milking them for the benefit of the television cameras, and living the unostentatious life of a villager, albeit an affluent one. His language consciously retained the kind of rusticity the city-dwellers looked down upon even if they found it amusing. But it was precisely these tricks of presenting himself as a man of the masses that paid heavy political dividends. But all good things come to an end. And Lalu Prasad may have overdone his act of playing to the gallery. Not only that, his focus on being the true villager amounted to letting the villages remain exactly as they were for generations - without roads and electricity and with primitive educational and medical facilities. It was this neglect -- either deliberate or because of oversight of what has come to be known as the bijli-sadak-pani (electricity-roads-water) factor, which proved to be his undoing as chief minister. Had he played his bucolic part for the first 10 years of his tenure to consolidate his base and then turned to the development issues, he would have been irreplaceable, especially because, as his successful stint in the railway ministry has shown, he has the capability for efficient management. Towards the end of his 15 years at the helm in Bihar, he did realize the need for turning his attention to development, but it was too late by then. But what goes around can come around. Who knows that, as the wheels of politics turn, Lalu Prasad can still achieve in Bihar what he has done in Delhi? He is still young, as politicians go.